Are we in trouble for The four-team repechage tournament in November that represents its last chance to qualify for the 2019 World Cup. This has not been a great Test Match Summer for Canada. I’m worried as with other fans on the direction with the mens 15 game? Lets hope we can make it to another RWC! Canada typically is not supposed to lose to Russia in men’s rugby, but someone forgot to tell the Russians. 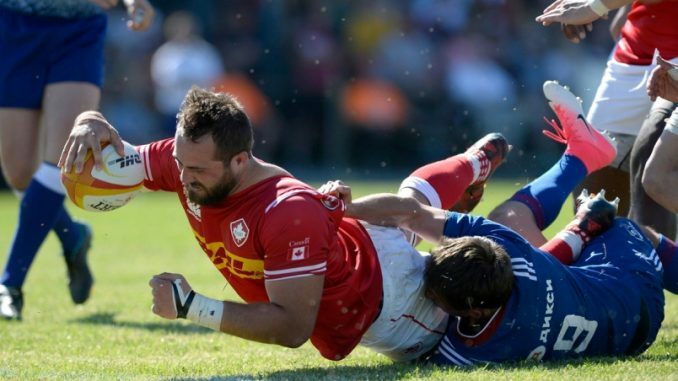 Russia picked up its first-ever victory over Canada in men’s rugby with an impressive 43-20 win Saturday afternoon at Twin Elm Rugby Park in Ottawa. Nick Blevins also scored, while Brock Staller had two penalty kicks. Anton Rudoi led the way for Russia with three tries, while Aleksei Mikhaltsov had two. The match was the second of three test games as part of Canada’s Summer Series. Canada, ranked 21st in the world as of June 10, is now 0-2-0 after losing its first match 48-10 to Scotland in Edmonton last weekend and wraps up the series against the United States in Halifax on June 23. No. 19 Russia is 1-1-0 as it lost its opening match to the U.S. 62-13. Canada had a perfect 4-0 record against Russia going back to its first meeting in 2009, but struggled mightily on Saturday. Canada’s head coach Kingsley Jones admitted his team may have taken the Russians too lightly and while the loss was deflating, it might be for the best in the long run. The Canadian men are using the June internationals to gear up for a four-team repechage tournament in November that represents its last chance to qualify for the 2019 World Cup. The Russians couldn’t deny the win over Canada was very rewarding. Leading 26-10, Russia continued to dominate right from the start of the second half when Mikhaltsov scored his second try of the game. With a successful conversion, Russia took a commanding 33-10 lead. Rudoi picked up his third try of the day early in the second half to put the game well out of reach as Russia led 40-13 to the disappointment of the 3,312 on hand. A penalty kick in the 68th minute rounded out the scoring for Russia. Canada was able to give fans something to cheer about in the dying minutes as Blevins beat his defender to score his first and the team’s second try of the game. Canada also scored on a penalty kick in the second half. The home side got off to a good start taking a 3-0 lead on a penalty kick early in the game, but from that point on it was all Russia. The Russians went on to score four tries and jump out to a 19-3 lead before Canada was able to score its first try late in the half as Campbell powered through the defence and punched his way in, while Staller was successful on the conversion to make it a 19-10 game. The Russians came right back and scored yet again to take a 26-10 lead at the half.